Overall, the Red Carpet disappointed this year in terms of ‘wow factor’, but I did manage to find a few dresses to award Academic Achievements to. Cate, Helen, Anne, Michelle and Georgina all looked gorgeous, in a style that suited each woman’s individual personality. What was harder to find this year amongst the pre-allotted jewels, were the accessory gems that distinguish a wallflower from the bunch. Now Lynn Wyatt’s industrial-sized necklace of raw gemstones may not be everyone’s cup of tea, but I applaud her for taking a risk and for literally rocking a dress that a woman less than half her age wore very well at the Met ball last year. Wyatt is no wallflower, not with that figure. Lynn Wyatt in a chunky choker at the VF Oscar Party. Diamonds were de rigueur on le tapis rouge, so where colour was present, the carats took a back seat. My favourite jewels were on Natalie Portman’s ears. Swing out sister: Portman in tassled Tiffany danglers. Am I drooling? Sorry. Need those. What’s the point of an accessory, however, if you can’t have a little fun with it? Helena Bonham Carter – whom for me will forever be Lucy Honeychurch – added to her quirk quotient with a cheeky garter and fan bag. We're all patriotic underneath, aren't we? HBC on the Red Carpet before the broadcast. She wasn’t the only one with multiple accessories. In DVF’s case, I wasn’t sure where to look first – the turquoise, the poise of fur shoulders or at the best accessory of them all – a Rolling Stone. 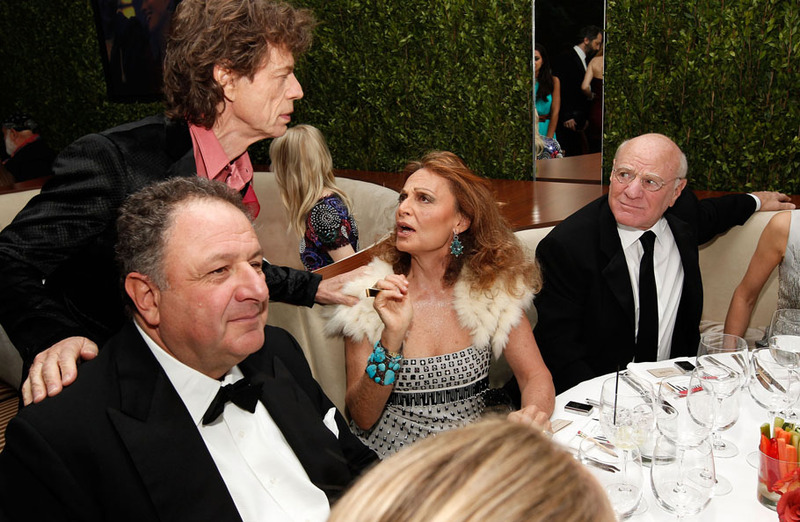 Diane von Furstenberg, Mick Jagger and Barry Diller at the VF Oscar Party. When Aaron Sorkin got up to accept his Best Adapted Screenplay statue, my eyes went to what the woman he was with, was wearing – Donna Karan, if I am not mistaken? The Donna drape? Aaron Sorkin and his guest, before the show. Matthew McConaughey certainly accessorized well, with Camilla Alves. She looked elegant in a black dress on the Red Carpet, which I didn’t think was worth mentioning – but this is the dress that really made me notice her. It’s a stunning lace-overlay gown that she donned for the Vanity Fair do. 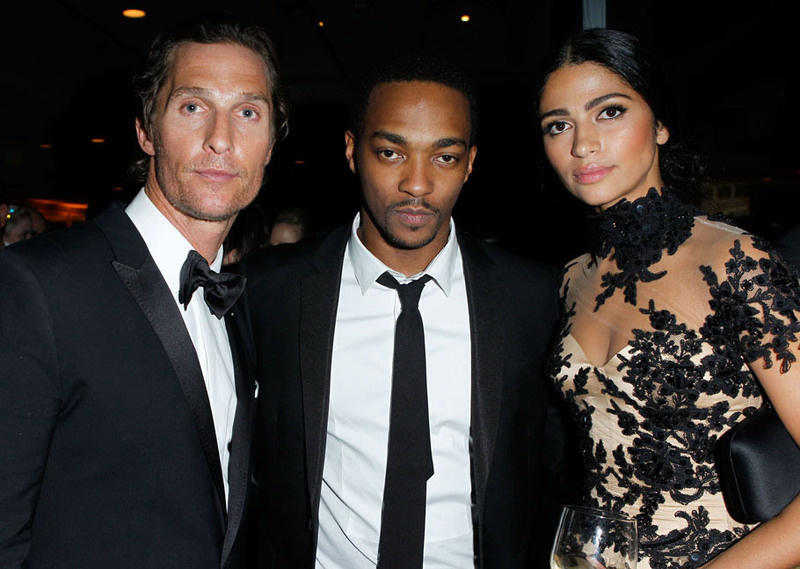 Matthew McConaughey and Camilla Alves and some guy between them, at the VF Oscar bash. Adored it. And loved her hair and makeup. However, MM’s blank stare is distracting and somewhat detracting from her look. Maybe Camilla needs to re-accessorize? Images (in order): BFAnyc.com courtesy of Vanity Fair, JustJared.com, Telegraph UK, Getty and Getty/Vanity Fair.